Divide. Divide. Divide. Divide. That’s the liberal strategy to maintain power. Pitting one race against another and inciting class envy. Standard liberal policy. The newest liberal “divide and conquer” movement centers around the notion and myth of “white privilege,” intended to make whites feel guilty and blacks to feel inferior and aggrieved. And it works. It has polarized the races and created resentment and hatred, the goal being to turn those who will be fooled by this nonsense into flaming liberals, many blacks believing that since the philosophy of white privilege, which they have bought into, emanates from the left, then that is where they will find kindred spirits and philosophical brethren, and many whites believing that the left is where they will find absolution for the horrendous sin of being born white. That is how warped adult leftists view race. 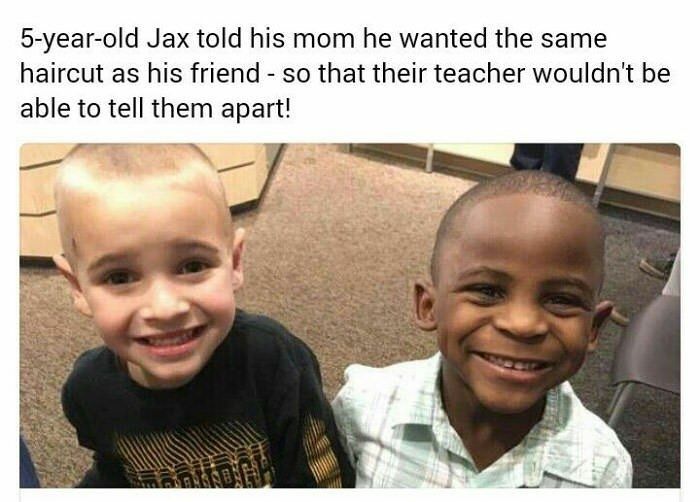 But, children, they don’t see race…. until they are taught to see it by adults. A North Carolina mom was recently outraged when her eight-year-old son was sent home with a pamphlet describing white privilege. 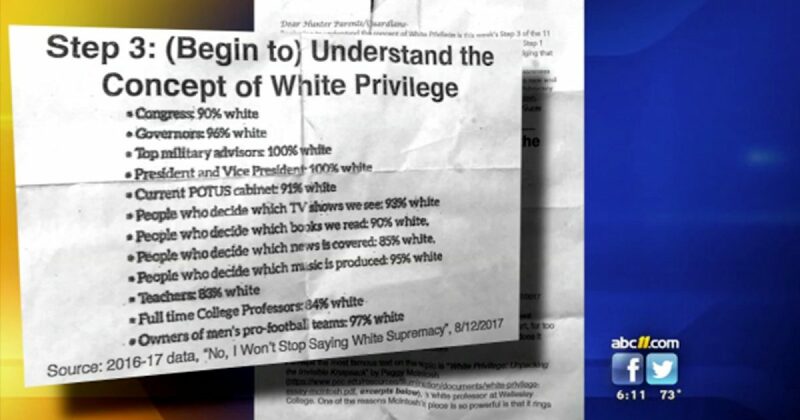 Amber Pabon says she found the two-sided piece of paper detailing white privilege in her eight-year-old son’s folder after he came home from Hunter Magnet Elementary in Raleigh last month. The pamphlet explained how white people were overly represented in the government, military and media – and how that gives white people privileges not afforded to minorities. Unbelievable! Blacks represent 12% of the American population. What do liberals want, blacks forced into service in the Trump administration until some arbitrary liberal quota has been achieved? Should whites take a hard look at the NFL and NBA which are predominately black and demand reparations due to black privilege? Of course not! The best athletes get hired. Period! Likewise, government appointments, although Affirmitive Action and political correctness have somewhat contaminated and corrupted the process. In recent memory, there have been many brilliant African-Americans in high places in our government. A few who come to mind right away are Condoleezza Rice, Clarence Thomas, and Ben Carson. They weren’t appointed because they are black. They were appointed because they were the best candidate available for their respective positions. What was most heartbreaking to Pabon was how it affected her son’s identity. Pabon is outraged about the pamphlet because she thinks her son is too young to learn about systemic racism. While Pabon insists that white privilege was discussed in class, a school district spokeswoman says it was not part of the curriculim and that the pamplet was organized by the school’s Parent-Teacher Association. Multiple PTA members told WTVD that the pamphlets were meant for parents, not the children. It’s part of a larger initiative by the PTA’s advocacy team, which started sending out related pamphlets in February, during Black History Month.